This high strength supplement provides a full 500µg of biotin per capsule, a level that would be difficult to find in any ‘high street’ multi-vitamin and it is made in the UK to pharmaceutical GMP standards. Biotin contributes to the process that releases energy from food and in the maintenance of normal skin and mucous membranes. It also contributes to the normal function of the nervous system and the maintenance of normal hair. This is an interesting member of the B vitamin family because it is made by the bacteria in our digestive system and we can absorb it from this source. However, antibiotics and intestinal disturbances can disrupt its normal production. 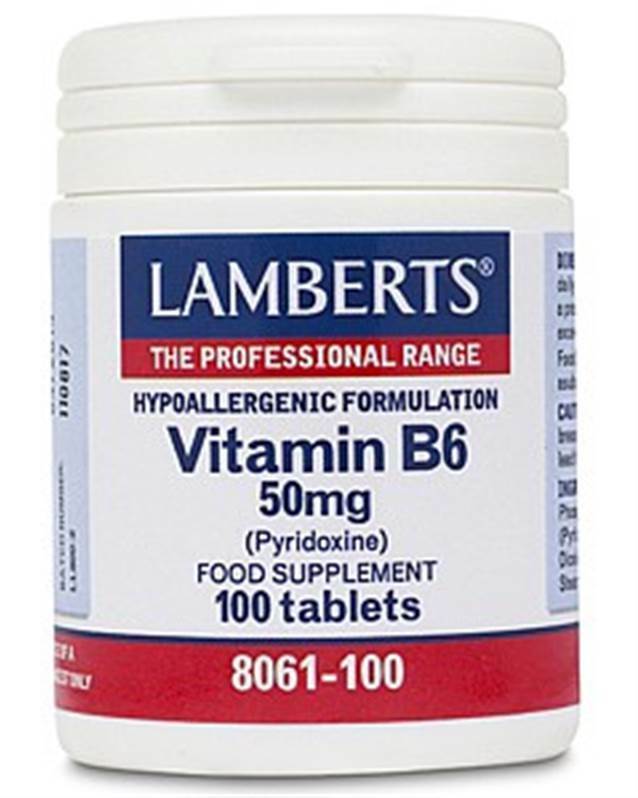 Lamberts Vitamin B6 50mg 100 tabs Health Supplement Vitamin B6 refers to a family of three closely related, water soluble compounds: pyridoxine, pyridoxal and pyridoxamine. The conversion of vitamin B6 into the active compound of pyridoxal-5-phosphate occurs naturally in the body, and whilst supplements providing P-5-P are believed to be slightly better absorbed than pyridoxine, the difference is not seen as sufficient reason to use this more expensive form of the nutrient. Vitamin B6 is probably involved in more processes in the body than any other B vitamin, but despite this up to 25% of women have diets that provide less than the RNI for this vitamin (and the RNI is just 1.2mg which is likely to be a long way short of an optimum intake). Vitamin B6 is popular with women as a pre-menstrual supplement as there is some evidence that it may assist in essential fatty acid metabolism and fluid balance. It is now well established that deficiencies of vitamin B6 can raise homocysteine levels in the blood, a factor that has been implicated in the development of cardiovascular diseases. Encapsulated With : Cellulose Rice Powder Capsule Shell (Hydroxypropyl Methylcellulose) Silicon Dioxide Magnesium Stearate.